Contributions are welcome. Please email to basscoastpost@gmail.com. 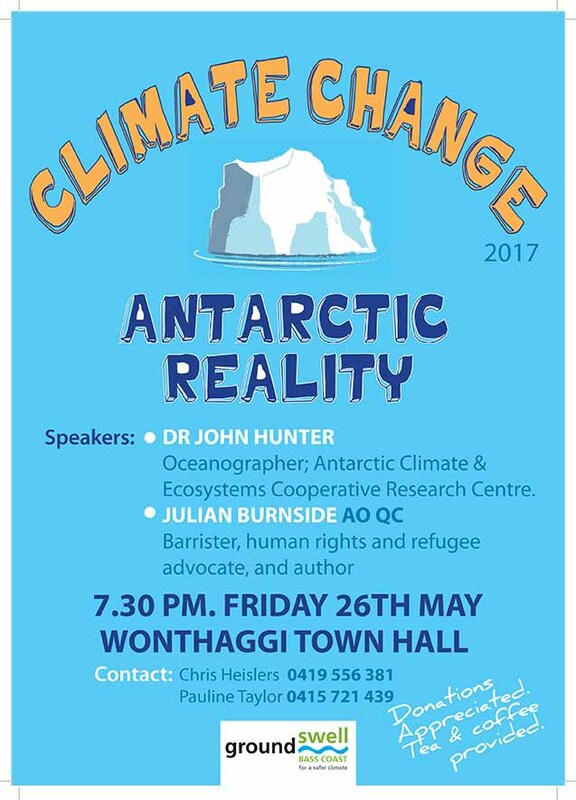 GROUNDSWELL Bass Coast is excited to be presenting Dr John Hunter and Julian Burnside at our next forum at the Wonthaggi Town Hall on Friday, May 26. Oceanographer John Hunter's recent work has involved investigations of sea-level rise in Australia, the US and in the Indian Ocean and Pacific regions, and the way in which this rise increases the frequency and likelihood of flooding events. He is especially interested in the response of Antarctic ice shelf cavities to global warming. Julian Burnside, AO, QC, is a practising barrister, human rights and refugee advocate and author. At the forum, he will be talking about climate change and its effect on refugees. As a tribute to John Clarke, the forum will include a screening of a John Clarke and Brian Dawe sketch on climate change. 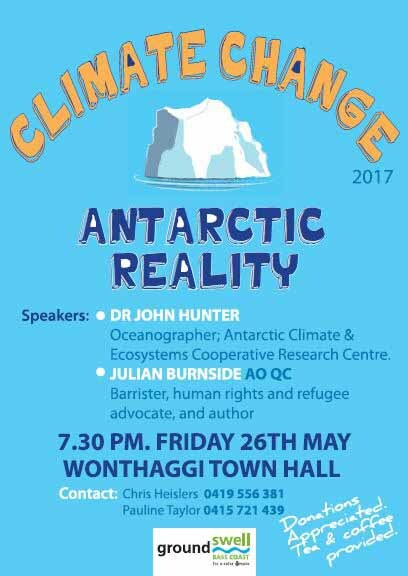 Antarctic reality: Wonthaggi Town Hall. Groundswell Bass Coast forum, with Dr John Hunter and Julian Burnside. BASS Coast Shire has become one of Australia's first councils to use carbon credits and the federal Emissions Reduction Fund to help reduce the costs to ratepayers of providing waste management services. It might also use carbon credits to help reduce the costs of next year's planned expansion of its household waste collection service to include food and garden waste. Bass Coast Shire will earn the credits by capturing methane from its Grantville landfill and flaring it. Methane is an extremely powerful greenhouse gas (21 times stronger than carbon dioxide) and flaring converts it to less harmful carbon dioxide. The shire first had to get its landfill gas project approved by the Clean Energy Regulator, which checks that the correct procedures are being followed and that capture rates are being properly monitored and reported. Then, at last month's federal government-run Emissions Reduction Fund (ERF) auction, it earned the right to sell those credits to the federal government, becoming one of only nine councils that have so far won ERF contracts. The shire's ERF contract is for the sale of 44,540 credits over seven years. The council isn't allowed to disclose the actual contract price, but the average ERF auction price was $10.23 per credit, meaning the contract will provide Bass Coast with a useful revenue stream to help cover the costs of remediating the landfill to meet EPA Victoria standards. Although the ERF has its fans and its critics, the underlying procedure of earning carbon credits from projects that cut greenhouse gas emissions and then selling them is accepted by all major parties. Bass Coast Shire's sustainable environment manager, Deirdre Griepsma, who developed the Grantville project in conjunction with well-known waste consultancy MRA, told the Bass Coast Post there might be more opportunities to earn money by cutting methane emissions from waste. The council is currently evaluating tenders for the provision of a household food waste and garden waste collection service, which would augment the existing two-bin rubbish and recyclables system. Council is likely to make a decision on the tender in July, and the new three-bin service could start in September next year, Ms Griepsma said. Although several Victorian councils already have a three-bin system that includes collection of food waste, the move will make Bass Coast Shire the first in Gippsland to introduce it, she said. Diverting food and green waste from landfill altogether can result in significant reductions in greenhouse gas emissions, and Griepsma said the shire is open to the prospect of earning credits from its new three-bin system and then selling them to help reduce its waste management costs. A scientist, an economist and a psychologist will tackle the big questions on climate change at a Wonthaggi forum next week. THE recent Paris United Nations Conference on Climate Change resulted in a world agreement to attempt to limit global warming to 1.5°C, but is Australia doing enough? Is limiting global warming to 1.5°C even feasible? And what must we do, both as a nation and individually, to limit global warming? As a Groundswell member who lost my home and a number of friends in the Black Saturday fires, I’m worried that climate change means we are seeing more and more disasters in Australia and all over the world. I know what we went through and I hate to think about the number of others who will be similarly affected in increasing numbers. We can’t stop all disasters, but we have to limit those “natural disasters” caused by human activity. I experienced Black Saturday in the Yarra Valley. Fortunately the effects of Black Saturday were not as severe in Bass Coast, but there were 11 deaths and much suffering at Churchill, and Wilsons Promontory suffered horrendous fires two days later. With questions raised by the Paris climate change conference in mind, Groundswell Bass Coast members have organised a forum with three internationally acclaimed speakers. Members were keen to approach the question from varying points of view, so have arranged for experts from science, economics and psychology to address the conference. The different approaches should make for a very enlightening forum. David Karoly, a professor of atmospheric science in the school of earth sciences and the ARC Centre of Excellence for Climate System Science at the University of Melbourne. An internationally recognised expert in climate change and climate variability, he is a member of the Climate Change Authority which advices the Australian government and a contributor to the Intergovernmental Panel on Climate Change. 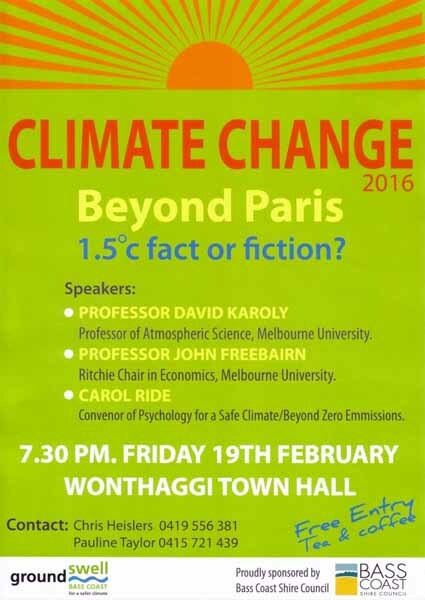 The Groundswell forum on climate change, Wonthaggi Town Hall, 7.30pm, Friday February 19. Inquiries: Chris Heislers, 0419 556 381. “Bass Coast is particularly prone to the effects of climate change. Less rainfall, greater climate extremes, more extreme weather events, more bushfires and the dramatic coastal effects of rising sea levels along with the hidden but likely catastrophic effects of ocean acidification are happening now and will dramatically worsen unless Australia and the world act strongly. John Freebairn a professor in economics at the University of Melbourne, and expert in the economics of climate policy. Carol Ride, a psychologist, and a member of Psychology for a Safe Climate; a not-for-profit organisation formed in response to the lack of individual and community engagement with climate change. Their aim is to increase understanding and engagement with climate change so that people will become free to act, rather than react or withdraw in despair. 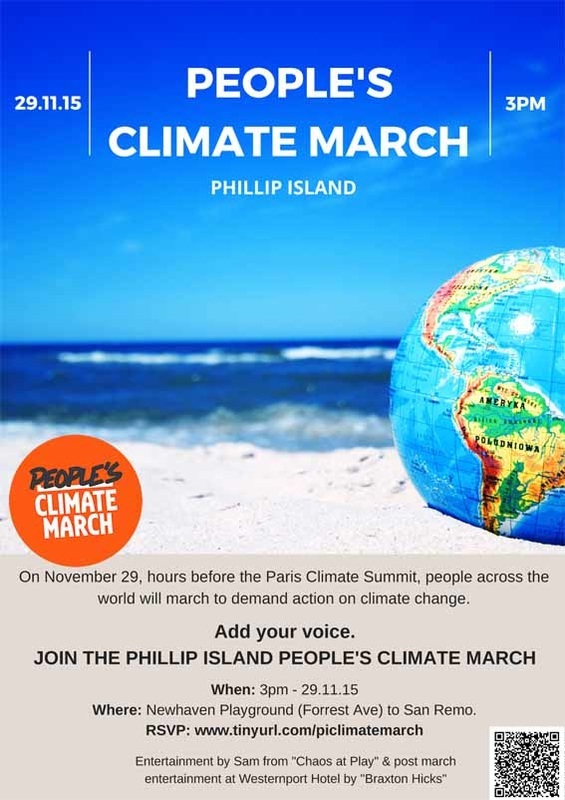 BASS Coast will be well represented at the People’s Climate March in Melbourne on Friday, November 27, with the council partnering with Groundswell Bass Coast to promote the march. With world leaders to meet in Paris for the UN Climate Change Conference, people in cities all over the world will come together to call for a transition to 100 per cent clean energy and an end to fossil fuels. Cr Neil Rankine said Bass Coast Council was encouraging residents to take part in the Melbourne March. “If we don’t do something soon, the costs from the implications of climate change to the council will be huge; we’re at a tipping point now. Council also understands the potential benefits of embracing renewable energy." The council has been assisting Groundswell Bass Coast to promote the March locally, working with Groundswell Bass Coast to distribute posters and flyers. Groundswell member Aileen Vening said that with Australia creating more greenhouse gases per capita than any other country, Australia must agree to more ambitious targets at the UN climate talks in Paris. Individuals could also play their part. “Measures such as installing insulation, blinds and more efficient appliances are creating jobs and reducing energy use. Around 1.4 million households (one in 10) have installed rooftop solar panels and are enjoying reduced electricity bills. Our air is cleaner because less coal is being burned. Ms Vening said the march would send a message to Australian leaders that effective action was required urgently. Marches are happening in Melbourne at 5.30pm on Friday, 27 November, starting from the State Library, and at Newhaven at 3pm on Sunday, November 29, starting from the Newhaven playground. People wanting to attend the Melbourne March can catch V/Line buses at local bus stops on the Friday afternoon, with return buses leaving Southern Cross Station at 7pm and 9pm. Ms Vening suggested people book ahead in case a second bus is required. Groundswell will also offer car-pooling. For more information, email groundswellbasscoast@gmail.com. April 26, 2014 - Instead of railing against the council’s coastal inundation forecasts, perhaps landowners should be demanding government action on climate change, suggests Michael Whelan. July 26, 2014 – The problem with the carbon tax, writes Greg Hunt, is that it didn’t work. The Environment Minister and Flinders MP answers his critics. July 18, 2014 - He was acting at the behest of the Prime Minister but it is Greg Hunt who will be remembered as the environment minister who destroyed Australia’s climate policy, writes Michael Whelan. The Coalition claimed its Direct Action plan would absorb 15 million tonnes of CO2 a year. BERNIE MCCOMB did the sums and found a $74.5 billion hole in the argument. It must be reassuring for so many people to simply "believe" things but some of us need to do the simple sums to make sure we're not being taken for dummies. This article is triggered by a recent news item from Flinders MP Greg Hunt, the probable Liberal Minister for the Environment, in last week's Phillip Island Advertiser, which stated that the Green Army contingent for Phillip Island would be a whole 10 youth volunteers to plant forests. 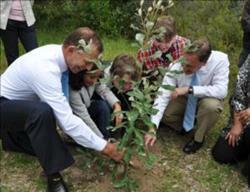 Greg Hunt pictured at Rosebud last year with the Opposition Leader Tony Abbott while announcing a Green Army project. On January 14 2010, Opposition Leader Tony Abbott announced the creation of the Green Army. The stated objective was to plant enough forest to absorb 15 million tonnes of CO2 a year by 2020. According to Australia’s Chief Scientist, forests absorb CO2 at 0.5-2 tonnes per hectare per year. Taking a mid-value of 1 tonne, this means an area of 15 million hectares – 150,000 square kilometres – would need to be planted at 1000 trees per hectare to absorb 15 million tonnes of CO2. That’s 15 billion trees. Direct Action claimed 20 million trees at $5 per tree, amounting to $100 million, but the summary on Page 31 allocates just $50 million. That’s a small $50 million mistake. But at $5 for each of the 15 billion trees actually required to absorb 15 million tonnes of CO2 a year, it’s a $74.5 billion whopper of a mistake. If the real plan is not to absorb 15 million tonnes a year but to work with just 20 million trees, this means absorbing only 20,000 tonnes of CO2 a year. The plan budgets $100 million for this exercise, which works out to a return of $5000 for every tonne of CO2 absorbed! That’s only a small proportion of Australia’s greenhouse gas emissions of around 630 million tonnes a year, or around 27 tonnes of CO2 per person a year (the highest in the world). By the time the massive new Galilee Basin is exporting coal from Abbott Point in the Great Barrier Reef, including liability for emissions from this coal, our score will be close to 100 tonnes per person. With Australian emissions three to 10 times higher per person, the whole Green Army and forest solution is nothing more than a distraction. No wonder the Coalition didn't submit its costings to Treasury well before the election. Sometimes every little helps. At other times, every little just gets headline news, causing confusion and worsening the problem. Finally, why call 15,000 young tree planting conscripts an Army? Who's the war against this time?